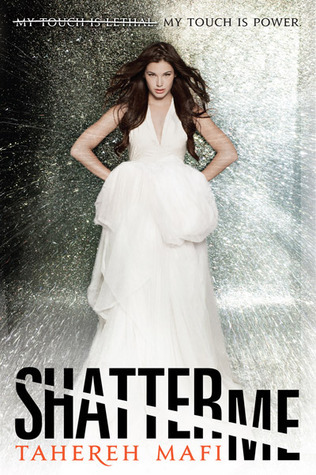 Review: Shatter Me by Tahereh Mafi - Book.Blog.Bake. As soon as I read the summary for Shatter Me, I knew this was a book I just had to read. The premise was too intriguing to pass up, and it sounded exactly like my kind of book. For the most part, it did not disappoint. The writing is unique and experimental, which I appreciated. At first, it was hard for me to get into Juliette’s, the main character, head because of the writing style, but as I became engrossed in her story the writing just sort of fell away and what was left was a beautiful, if haunting at times, look at a character who has endured so much. I really enjoyed the exploration of Juliette’s humanity and how she came to embrace it over time. When we meet Juliette, she is, understandably, quite a wreck. She hasn’t had human contact in so long, hasn’t spoke for over 200 days, and has quite a heavy case of a personal crisis. By the end, Juliette interacts with people and realizes what kind of purpose she may have. I think what really makes this book work is the first person perspective. I got to explore the world and other characters to Juliette’s eyes, which made Warner even more creepy and the idea of what the Reestablishment was doing to the world even more haunting. I found Adam a little flat at times in the middle of the book, but by the end I was genuinely enjoying reading about every character. I think this book would lose a lot of appeal for me if it hadn’t been told from Juliette’s perspective. I think I would have gotten bogged down in the experimental writing and been overwhelmed with the world to the point I didn’t care about the characters any more. The story is fast-paced and well-plotted for the most part, but the thing that keeps this from being a 5 star book for me is mainly the way the book ended. By the time I reached the end, I felt all I had read was the set-up for a more interesting story. While I’m definitely excited about the sequels for Shatter Me, I have to admit that after reading, it just all seemed like an introduction for anything that could happen in the next books. There’s a few events that take place at the end that I would have enjoyed more if those plot developments had taken place in the middle of the book and had been explored more before the last page. Final Impression: It’s an unique story that won’t appeal to everyone, but I loved seeing this new world through Juliette’s view. I wish this book had been developed a little more and seemed like less of a springboard for future novels, but I still thoroughly enjoyed it. 4/5 stars. I also loved this one!! Right from the beginning I was all WOW. YEP MUST KEEP READING. I love the fact that the writing style was so jarring and totally got you into the feel of Juliette’s mind! Great review! Haha so many!! I put in a huge order at the Book Depository to get on top of some of them, but there are way too many to keep up with, so true. I’m actually liking Warner better than Adam at this point, because Adam is just too perfect, even if Warner is creeeeepy.